Yet another security breach in the news. Want to find out if any of your email accounts have been breached? 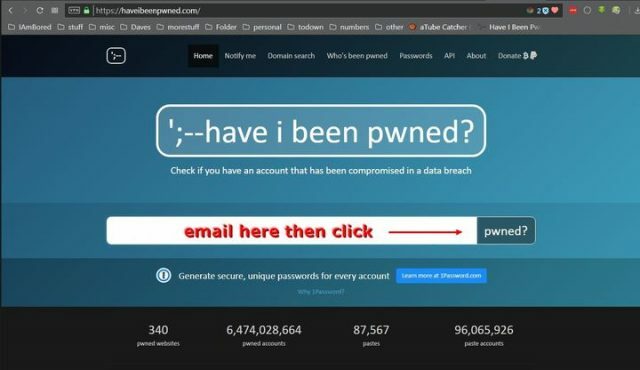 Just go to Have I Been PWNED. Type in your email address and click on the pwned? button at the end. You’ll either get a Green Good News – no pwnage found!, a Pop-Up, or a reddish-brown Oh no – pwned! result. Out of my six email accounts, only one was found pwned. No surprise to me– it was my Yahoo account. I’m soon going to get rid of that thing altogether. Low and behold, a very old database shows that I was pawned way back in October 2013, when 153 million Adobe accounts were breached. My password was changed immediately then and has being replaced two or more times – yet since it is the same email account, I receive this constant reminder. But, since there might be no way to know if people were aware, or changed their password, this hint is a mixed blessing, Mindblower!